Let us consider a serious question that demands an accurate answer that is faithful to scripture. How can the configuration of the earth after a worldwide deluge be consistent with Uniformitarianism? Uniformitarianism is the theory that the earth was shaped by slow-moving forces still in operation today. 1 The account of the flood is diametrically opposed to any theory that suggests gradual change over long periods of time. An old earth theory destroys faith in the reliable account of the worldwide Biblical flood and replaces it with an alternative view that leads to less reliance upon the bible, wrong scientific conclusions, and ultimately Liberalism. Liberalism in the form of pseudo science is described in the third chapter of 2 Peter. “Know this first of all, that in the last days scoffers will come, living according to their own desires and saying, “Where is the promise of his coming? From the time when our ancestors fell asleep, everything has remained as it was from the beginning of creation. They deliberately ignore the fact that the heavens existed of old and earth was formed out of water and through water by the word of God; through these the world that then existed was destroyed, deluged with water” 2Peter 3:3-6. Peter makes it clear that our present world has been created by the worldwide flood that God caused. The statements, ‘the world that then existed was destroyed’ and ‘earth was formed out of water’ are not ambiguous; they do not even imply a local flood but worldwide devastation. "Behold, I, even I am bringing the flood of water upon the earth, to destroy all flesh in which is the breath of life, from under heaven; everything that is on the earth shall perish” Genesis 6:17. In this context, when God says everything, everything is what He means. The flood of Noah’s time was the greatest disaster the world has ever known; however, by it the grace of God also brought relief for many. “Out of the very ground that the LORD has put under a curse, this one shall bring us relief from our work and the toil of our hands.” (Genesis 5:29) Through the building of the Ark, and because of the flood man’s days on earth decreased from seven, eight, or nine-hundred years to 70. Hence, man received relief from work and toil, which was the direct result of the dramatically changed earth by The Great Deluge. The person who understands that the bible teaches a worldwide deluge will view the flood as the primary factor in earth’s present condition. Such a person should have no problem understanding that the end of the world will be with a dramatic worldwide changing event. Unless the first event was comparable to the second there would be no point for Peter to use it in his argument. The Gospel teaches judgment at the end of the age; men will face judgment based on their own “good works”, or the substitutionary death of the Lord Jesus Christ. As sure as judgment happened in Genesis by a flood, it will happen yet again at the end of this present age. If as Christians we believe in a coming judgment, whereby God creates a new heaven and earth then why not believe in a first judgment, whereby, God altered the world at that time? The Lord has made it clear concerning coming judgment. “…the heavens will be destroyed by burning, and the elements will melt with intense heat” 2Peter 3:12. In addition, our former bodies will be changed in the twinkling of an eye, and God will create a new heavens and a new earth. If we believe the destruction and recreation at the end of the world will take place suddenly and quickly, then why not the first time? Why should we need to believe that the first creation took billions of years? Will it be necessary for God to take billions of years to create the new heavens and the new earth or will He be able to do it by ‘fiat’ just speaking it into existence? Uniformitarianism is one of the most important unifying concepts in the geosciences. This concept developed in the late 1700s, suggests that catastrophic processes were not responsible for the landforms that existed on the Earth’s surface. This idea was diametrically opposed to the ideas of that period, which were based on a biblical interpretation of the history of the Earth. Instead, the theory of Uniformitarianism suggested that the landscape developed over long periods through a variety of slow geologic and geomorphic processes. The term Uniformitarianism was first used in 1832 by William Whewell, a University of Cambridge scholar, to present an alternative explanation for the origin of the Earth. The prevailing view at that time was that the Earth was created through supernatural means and had been affected by a series of catastrophic events such as the biblical Flood. This theory is called catastrophism. The Christian who defends Uniformitarianism and tries to explain it by some extra Biblical method furthers the cause of those who were opponents of a cataclysmic flood. However, a worldwide flood and not a series of local catastrophes is true of the Biblical account, no other interpretation is true to scripture. I am not a scientist and so it is not my purpose to refute the scientific evidence on either side; for further reading on a scientific approach read, “The Flood”, by Henry Morris. The apostle Peter, before he was offered on the altar as a martyr for his faith in the Lord Jesus Christ, wrote to those who he believed had a faith of equal standing as his own. The Gospel is truth; it contains no speculations or imaginations, it is exact, precise, and without error. The Gospel is the Bible, which is inherent and infallible, each part and the whole without error. Evolution destroys the Gospel by subtle means; it destroys in the minds of men the validity of the Word of God. The fact that some well meaning Christians can reconcile in their mind Evolution and the Bible is no consolation to those who because of inconsistency cannot. Stuffing billions of years in between the verses is not acceptable to most thinking agnostics and atheists; they find no validity in Christianity by making the Bible say something that is not justifiable by any well reasoning person. There is far more value in contradicting what someone says in earnest, than to agree with him apart from sound reason. No one is ever won to the Gospel through compromise. 3 The Principles of Geology: Being an Attempt to Explain the Former Changes of the Earth’s Surface, by Reference to Causes now in Operation (3 vols 1830-33). 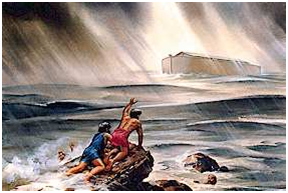 TagsDoes evolution allow for a worldwide deluge - should a Christian disannul the flood?